Jovian ships have been disappearing left and right for the last few months. Strangely enough, all of them vanished while passing close to Europa, one of Juipter's moons. And Now, an unscheduled merchant ship claims to be repairing its malfunctioning plasma drive near the mysterious moon. 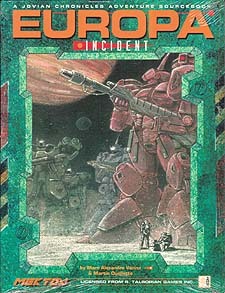 A team of exo-armour pilots are sent to investigate. Is there more to this than meets the eye? This book also contains a complete adventure recommended for 3-6 beginner-level players, although it is possible for two groups (up to 4 player each) to play at the same time. Also included are seven complete exo-armour designs, in addition to the deadly Lucifer Cybersatellite.